YouTube always has had a way with pranks. 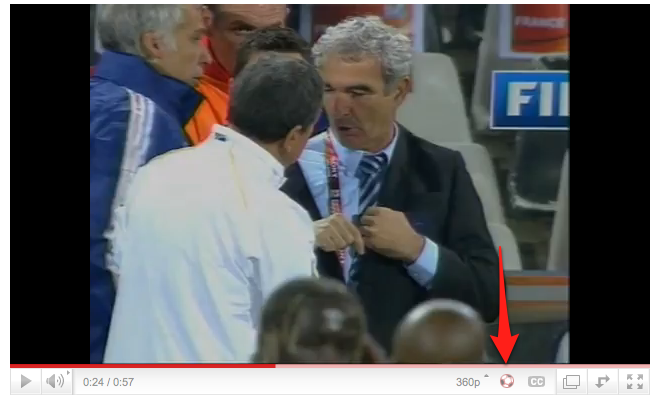 Some time in the last hour, the world’s largest video portal activated a new button on some videos that looks like a tiny soccer ball. Clicking it will activate an endless, incredibly annoying sound that sounds vaguely like a swarm of insects. Or, for anyone who has been watching the World Cup, like the dreaded Vuvuzela — an instrument commonly played in South Africa at football (soccer) games. South Africa is, of course, the host country for this year’s World Cup, and fans watching the games have been subjected to the vuvuzela’s mindless drone for hours on end. The noise is so annoying that television networks have taken measures to filter it out, and guides have popped up showing viewers how to block it from their TV sets and computers. But despite complaints, FIFA has decided not to ban the vuvuzela because of its traditional significance. Fun fact: one report says that the guy who brought the plastic vuvuzela to the market in South Africa is also in the business of selling ear plugs. Smart guy. I’m not seeing the button show up on all videos, but it is definitely appearing on some clips that aren’t soccer related. Here’s one that has it. Thanks to Ambuj Saxena for the tip.